Parking on an incline or decline can be especially dangerous. If something happens and your emergency brake goes out, your car may begin to roll. If the wheels are not angled right it can roll right into traffic, putting your car and even the lives of others at risk. How can you remember which way to turn your tires when parking on a hill? Unfortunately, there’s no fancy rhyme to help you remember the right direction. Instead, you have to visualize the direction your car might roll if the brake gets loose. 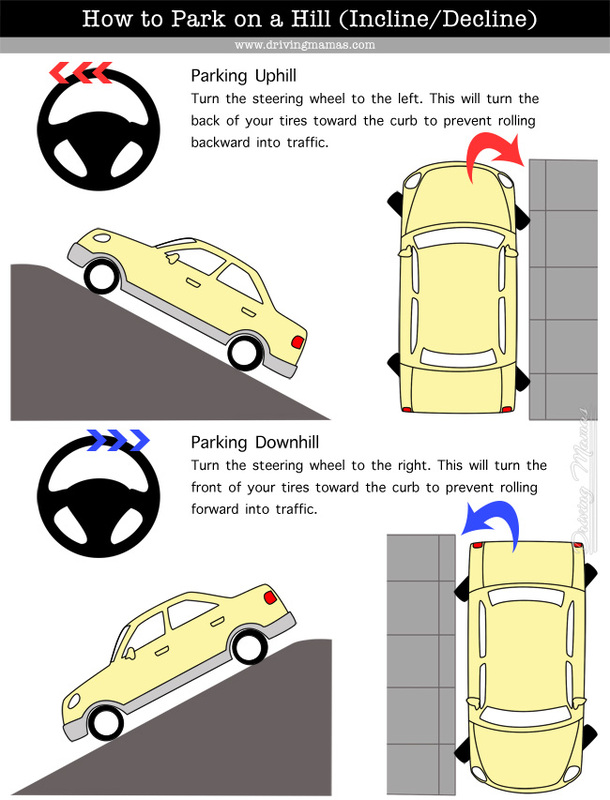 Here’s a handy tutorial on how to park on a hill depending on if you are facing uphill or downhill. For easy reference, you can download the full-size PDF here to print and leave in your car. I just made up an easy way to remember which way the wheels go!! “UP UP AND AWAY!! !” So, when parking UPhill, turn your wheels AWAY from the curb. Ha! Anyway, I think that’s pretty good. Hope that helps someone! Thanks for your great post!